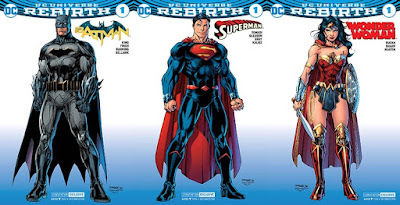 DC Comics and Graphitti Designs have teamed up to release three epic San Diego Comic-Con 2016 exclusive variant covers designed by Jim Lee to the first issues of their newly relaunched Batman, Superman and Wonder Woman comic book series! Released as part of the DC Universe’s Rebirth soft reboot, each SDCC exclusive Jim Lee cover features the titular hero imprinted on silver foil. These limited edition variants are sure to be highly sought after at Comic-Con and can be purchased for just $10 at the Graphitti Designs SDCC booth #2314.